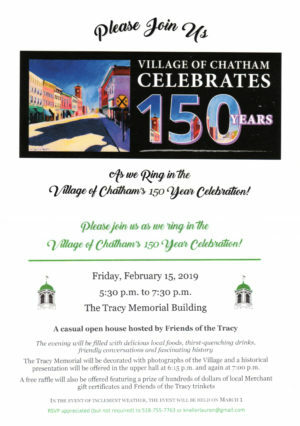 A Causal Open House to celebrate the Village of Chatham. The evening will be filled with delicious local foods and The Tracy will be decorated with historical photographs of the Village. A raffle will be offered featuring prizes and gift certificates from local merchants. The Tracy Memorial will be decorated with photographs of the Village and a historical presentation will be offered in the upper hall at 6:15 p.m. and again at 7:00 p.m.